If you are looking for great sound quality from headphones that don’t cost a fortune, take a look at the Coloud Pop Headphones. They have a great sound range, excellent comfort factor and a non-tangle design great for those on-the-go. All of this for $25 makes them a great value. The Coloud Pop Headphones are an in-ear design but are tilted to rest comfortably within your middle ear. There are multiple soft tips provided to fit your exact ear size to provide both comfort as well as seal your ear from outside noises. It connects to your Windows Phone via a 3.5mm stereo connector but will connect to any device with a 3.5mm headphone jack. The speaker drivers are 9mm in size and they can respond to a frequency range of 20 to 20,000 Hz with 32 ohm of impedance on the speakers. If you are not an audiophile this may not mean much to you. All told, for the price (even at the normal $24.99) you are getting a comfortable fitting headphone set that will give a wide, dynamic range of sound as you listen to your music. 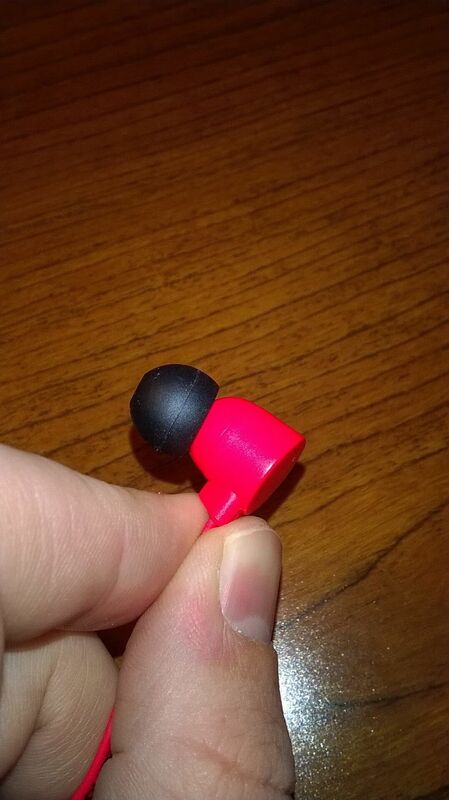 Often times lower end headphones sound “tinny” but these do not suffer from this problem. The rich, deep sounds are excellent with nice bass and treble on all types of music. The direction microphone of the Coloud Pop Headphones is on the right side cable and has a multi-function button on it just above the microphone. One click will allow you to play and pause your music as well as answer and hang up a phone call on your Windows Phone. Two clicks will move you forward to the next track while three clicks will rewind you back to the beginning of the current track or the previous track (depending on how are you are into the current track). In essence this allows you to control your music and calls while your phone is tucked away in a pocket or in your jacket and you don’t actually have to touch your phone to interact with it. 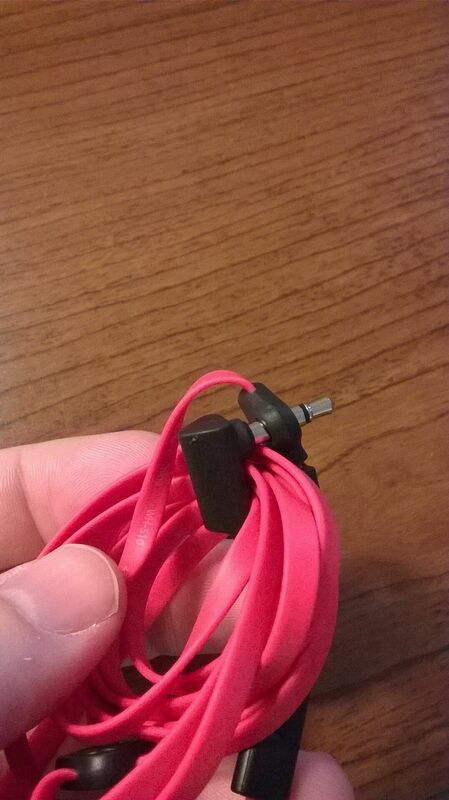 While there are some other headphones that will allow you to do the same thing, I found these worked brilliantly with both my Lumia 1320 and Lumia 635.
non-tangle design. Coloud, who designed these headphones for Nokia, has a patent pending on the flat cable design along with what the call the Zound Lasso. 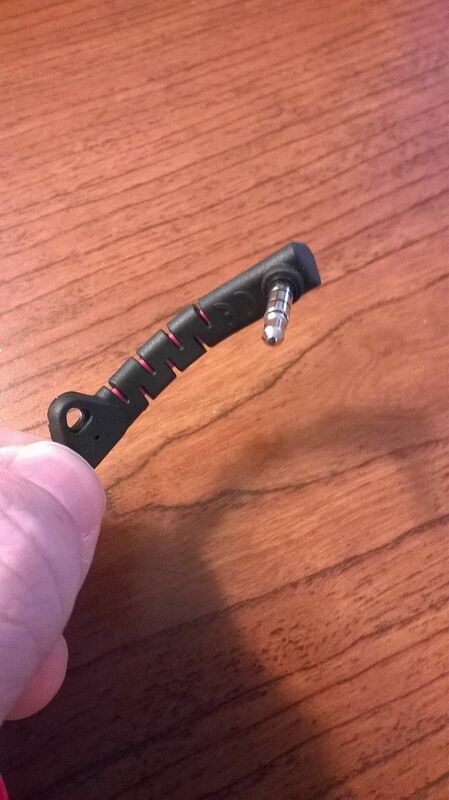 When you look at the headphone 3.5mm connector, you will see a rubber tab where the flat cable connect to the jack that has a 3.5mm hole in it. The idea is that you “lasso” the cord into a loop around this black tab (the Zound Lasso) then bend the connect back onto itself and push the 3.5mm connector through the, you guessed it, 3.5mm hole. It essentially locks the cables into a loop for easy storage while you are not using them and helps prevent tangles. Equally as important, this Zound Lasso is designed to be flexible to prevent cable crimping and connector damage. It is a well thought out design that works well if you get into the habit of using it. The second thing that makes these headphones stand out is the angled design of the earpiece. If you look at the close up of the earpiece you will see that the soft black tip is angled when compared to the body of the speaker assembly. This makes these headphones a very natural and comfortable fit inside your ear while the cord drapes down through your anti-tagus (the little gap from your middle ear to your ear lobe). This design also makes having the headphones in your ears for a long period of time no problem as they are light and comfortable. I’ve been using the Coloud Pop Headphones for about a month now and I have to say I’m very impressed. I’ve had numerous phone calls using them and the call clarity is outstanding and the microphone makes it easy for others to hear me. Likewise the sound range is excellent and no matter what type of music I’m listening to at the time, it is always rich and deep. were sold out. There is no indication of when they will be back in stock but keep checking the link provided at the end of this review. Don’t fret though as you can get them directly from Coloud for $25 (same price as originally at Microsoft) in way more color combinations available from them directly which may be a better option. No matter which color you buy, I think you will be pleased with the Coloud Pop Headphones. I love how the Zound Loop looks. But I’m probably to lazy to pack my headphones every time after I finished listening. Anyway looks like a nice product for cheap price. I couldn’t finish reading your review – the pop-up ads from the embedded links are so annoying. I’m sorry that you found the in-text ads a problem. I’ve not had any other complaints and this is a normal way for a site such as mine to help off set monthly costs. Otherwise seems like a quality product but they just don’t stick in my ears. Have used Nokia/Microsoft headphones before with no problems. Tried all 3 sizes of soft tips with no luck – really annoying. Will try all the soft tips that I have stockpiles at home, hope it will turn into joy..